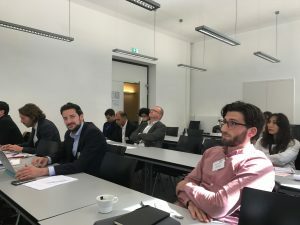 On September 20-22 FIRES researchers Jeroen Content, Werner Liebregts, Niels Bosma and Mark Sanders attended the 15th annual Interdisciplinary European Conference on Entrepreneurship research in Siegen, Germany. There they presented FIRES-work in a track dedicated to the Entrepreneurial Society and chaired by FIRES-coordinator Mark Sanders. The room was filled with researchers from all over Europe and various discipli nes and a fruitful discussion developed. The FIRES-research was greeted with overall agreement and useful comments and suggestions were made to improve the academic work. The track at the IECER 2017 conference, like the track in the IECER 2016, was part of the FIRES-stakeholder engagement strategy to bring FIRES-work to the fore in relevant academic conferences in a recognisable way. You can read a brief report on the FIRES-track in IECER 2017 here.